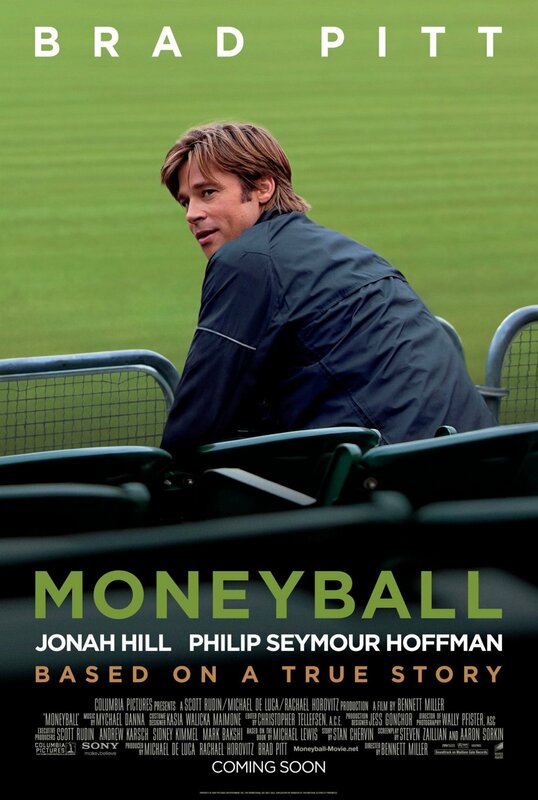 Based on Michael Lewis’s book of the same name; directed by Bennett Miller; and also starring Philip Seymour Hoffman, ‘Moneyball‘ tells the story of Billy Beane (Brad Pitt), a very ambitious general manager of Oakland A’s baseball team. Beane desires to see his team at the top of every league game, winning the World Series, but, due to the financial constraints, cannot realise his dream. Therefore, hiring a Yale economics graduate, Peter Brand (Jonah Hill), Beane uses statistical analysis, measuring in-game activity, to choose his team players. The players picked by Beane are those “undervalued” by others, even though they show a promising talent. Beane’s main premise here is that everyone in baseball asks “wrong questions”, for example concentrating on players’ usual winning record and subjective opinions of a player, rather than asking such objective questions as “which player on a particular team contributed the most to the team’s offense?” These are the principles of subermetrics or “baseball economics”. As Wikipedia states, sabermetrics is “concerned both with determining the value of a player or team in current or past seasons and with attempting to predict the value of a player or team in the future”. However, ‘Moneyball’ is not just about baseball. The film is also about human connections, family, loyalty, dreams, goals and career disappointments (throughout the film, Beane keeps re-considering his own career highlights and the fatal career mistakes he has made). Moreover, there is no real surprise that ‘Moneyball’ is so good, because, statistically, films which are based on true events generally fare better, and have a greater chance at succeeding at the box-office, than those that are not. For example, ‘The Basketball Diaries’ (1995), ‘Erin Brockovich’ (2000), ‘Blow’ (2001), ‘A Beautiful Mind’ (2001), ‘The Pianist’ (2002) and ‘Milk’ (2008) are all based on true stories, and they are all considered to be very successful films. The so-called “sport” films are historically faring rather badly at the Academy Awards. The 1970s saw ‘Rocky’ winning the Best Picture Award. Then, we had ‘Raging Bull’s nomination for the Best Picture Award in 1981, and ‘Chariots of Fire’ won an Oscar in the Best Picture category in 1982. ‘Field of Dreams’ was nominated in 1990, but did not win. ‘Jerry Maguire’ was nominated for the Best Picture Award in 1997, but no one can say that it is a strictly “sport” film. Contrary to popular predictions, however, films depicting sports of any kind have started doing slightly better at the Oscars in recent years. Clint Eastwood’s ‘Million Dollar Baby’ won the Best Picture Academy Award in 2005, and ‘The Fighter’ was nominated for the Best Picture Academy Award in 2011. Although “Moneyball” has few chances of winning in the Best Picture category this year given all the other films in the category, there are still Academy Awards in other categories up for grabs for this movie, including the Best Director and the Best Actor Awards. Brad Pitt gives a magnificent performance in the role of Billy Beane in ‘Moneyball’, and, therefore, deserves an Oscar Award nomination for his depiction. In the film, Pitt is compassionate, sympathetic, straightforward and funny. He is a true inspiration for his team. Philip Seymour Hoffman in the role of Art Howe, a strict baseball coach, is also very convincing. Jonah Hill and Brad Pitt actually make a rather nice team pairing. There is an unlucky friendship between their characters formed, but a great deal of mutual respect between the two is felt, as they influence each other and give each other advices on topics they know thoroughly. The downside is that ‘Moneyball’ is too slow at times, and there is humour seemingly “copied” from such films as ‘Jerry Maguire’ and ‘Up in the Air’ (2009). Also, knowing how Brad Pitt likes to eat while talking and walking in his films, e.g. ‘Ocean’s 11’ (2001), I still thought that maybe he should not have paraded his voracious appetite so overtly and so frequently in ‘Moneyball’, but here we go. Also, although ‘Moneyball’ does, at times, contain technical “baseball” slang, which is sometimes hard to follow, the rest of the film is quite easy to follow and entertaining. The chances are that you know something about baseball, even if you are not from the US. Few people have gone through their lives, watching American family movies, without encountering any depictions of the game, for example many people, undoubtedly, have seen such films as Spielberg’s ‘Hook’ (1991) and Petrie’s Ri¢hie Ri¢h (1994). I haven’t seen the movie and, admittedly, I kept trying to avoid it because I think baseball is such a soporific sport. I will give it a try, though. Brad Pitt has a good chance for getting an Oscar nomination. And I’m a fan of his so that’s another reason. Also, I’d like to see Jonah Hill play something else other than a silly teen. This seems like a good opportunity.